MWC 2011 was the place where the long rumored Facebook optimized HTC phones - the HTC ChaCha and the HTC Salsa - were made official. A few months have passed since then, but the good news is that we have the release details of these handsets courtesy of Amazon UK - they will be launched on June 26 in Britain and are already available for pre-order. HTC ChaCha, which offers (among other things) a 2.6-inch screen, 600MHz Qualcomm MSM7227 processor, Android 2.3 plus HTC Sense and a portrait QWERTY is available for $409 (£249.99), while the HTC Salsa, which packs pretty much the same goodies - except for the screen, which is larger at 3.4-inch and sans the keyboard - is available for $524 (or £319.99). As can be expected, these are off-contract prices. 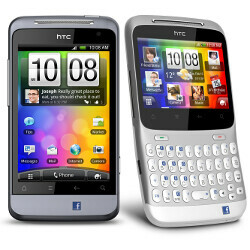 If you are eager to learn more about these cute handsets, go this way for our HTC ChaCha Hands-on and HTC Salsa Hands-on.